The 18th annual Gumball 3000 went from Dublin to the Romanian capital Bucharest and cost £35,000. 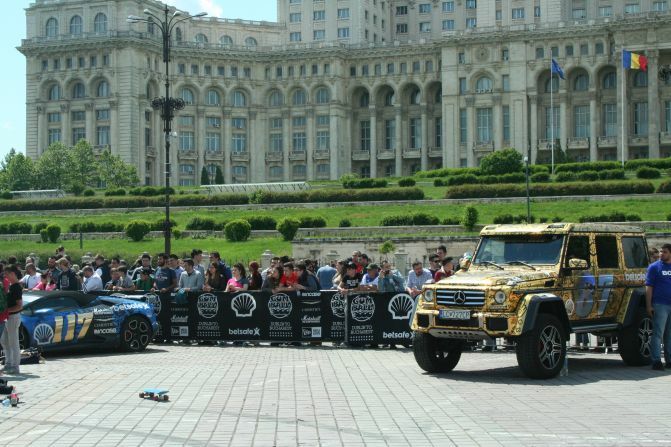 The 18th edition Gumball 3000 has finished today in Bucharest. Over 120 supercars participated at the 18th edition. The participants drove 4,800 km through 11 countries in only 6 days from Dublin to Bucharest. The list of celebrities for this year include the famous DJ Afrojack, rapper EVE, hip hop stars Bun B and The Alchemist, the main actor from the Baywatch series David Hasselhoff, F1 drivers david coulthard and Jean Alesi and the skateboard star Hawk. The list of the supercars participated at the 18th edition can make tough competition to any motorshow: McLaren 650, Porsche 911 Turbo, Rolls-Royce Phantom Coupe, Bugatti Veyron, Lamborghini Aventador, Ferrari 458, Audi RS6, Bentley Continental. A special presence was the new Mercedes G500 4×42, which is not really a car for high speed long cruise with its 45 cm ground clearance. The Gumball 3000 is an annual British international celebrity motor rally which takes place on public roads. It was started in 1999 by Maximillion Cooper, with the idea to combine cars, music, fashion and entertainment. The Gumball 3000 has received criticism. Two pensioners died in an accident in Macedonia in 2007 after their car was hit by a Gumball rally driver. Along the years, participants have been stopped for speeding, have had their driving licences taken by police, and had their cars confiscated. An incident happened also to this edition. The german citizen Netzer Kai, according to romanian police, lost his driver licence for three months. His Porsche 911 turbo was surprised with 191 km/h at 86th kilometer of Pitesti-Bucharest yesterday.